What happens when your normal parking areas are temporarily out of service? Or if you are expecting a lot more traffic than your normal parking can typically handle? Or if the parking spaces your employees typically use are needed for guests or visitors? When you need to create remote parking on a short-term or long-term basis, your first and only call should be to FloridaTours.com. We can help you create the remote parking solutions you need to keep your business running problem-free. The way to deal with most parking problems is to create additional parking somewhere else. When your normal parking patterns are disrupted due to volume, construction, or other causes, one of the easiest and best solutions is to arrange for additional parking at a remote lot and then bus people back and forth using shuttle buses. Remote parking can solve just about any parking problem, whether it’s a short-term disruption due to special events or a long-term parking crisis caused by a major construction or rebuilding project. Whether you need to transport guests from remote parking areas to your business or employees, it’s important to treat people with the dignity and respect they deserve. The last thing you want is to cause even more problems by offering old, broken down school buses to solve your parking problem. 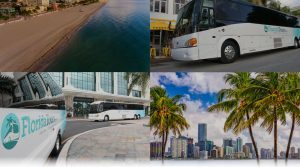 Instead, you can charter new, luxurious charter buses from FloridaTours.com that will make the best possible impression for your business before your guests even walk through your front door. Plus, the inconvenience of having to park remotely can be mitigated by offering your guests luxury accommodations as they take a shuttle to your business. Luxury charter buses from FloridaTours.com can help transform parking problems into net positives for your business.